(June 15, 2015) -- Medically speaking, an aneurysm can be a time bomb. Ender Finol, associate professor of biomedical engineering at UTSA, wants to make them a little more predictable. 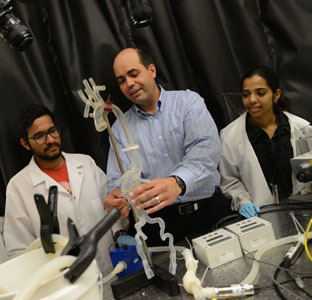 Finol has just received a $1.8 million grant from the National Institutes of Health to develop a method to determine whether a patient with an aortic aneurysm needs surgery right away. Although in the mainstream “aneurysm” tends to mean a blood vessel bursting in the brain and causing sudden death, it’s actually more complicated than that. Firstly, people with aortic aneurysms don’t know they have them unless a doctor discovers one by accident or it ruptures. In the latter case, there’s about an 80 percent fatality rate. If the aneurysm is discovered before it ruptures, the patient is put under observation. Doctors wait until the aneurysm grows to about five cm in diameter, then recommend surgery. However, this isn’t always necessary, and it could be costing lives. His solution is a portable device, most likely a computer tool on a laptop, with a database that he’s currently developing. Surgeons would upload medical images of the aneurysm, and the computer would respond by determining whether surgery is necessary in the near future. The tool will be validated with magnetic resonance images of a silicon replica of an aorta that will help Finol mimic the blood flow through a real aorta. His work begins this summer.